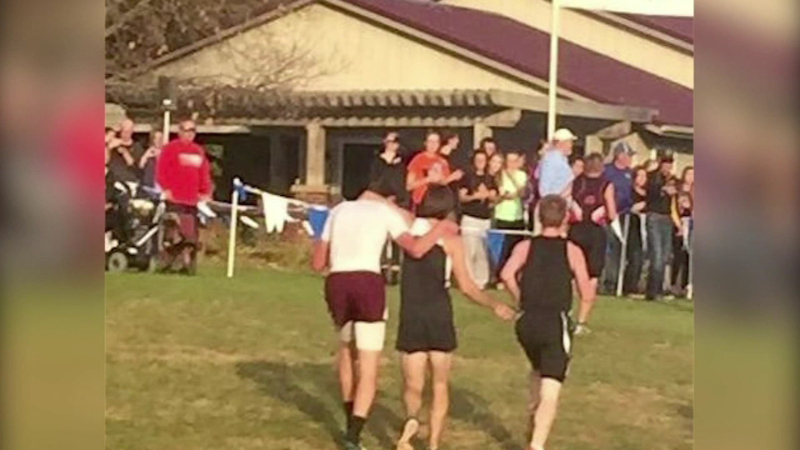 A high school cross country runner in Iowa is paying a personal price for an act of kindness. BLOOMFIELD, Iowa (WLS) -- A high school cross country runner in Iowa is paying a personal price for an act of kindness. Zach Houglund had just won the district meet Thursday when he spotted a rival going down clutching his chest. He jumped in to walk beside his competitor and gave him a push into the finish line. After that he was disqualified. The rule states no runner can help or receive aid from another runner. "I just thought it was the best thing to do," Houglund said. "I know I wanted to be a good sport about it." "True example of sportsmanship and character," said Davis County Coach Josh Husted. "He'll always remember winning that race and doing the right thing." Houglund will get another chance. Despite the disqualification, his team qualified for the state meet, meaning he will be running for a medal next Saturday.